Download our free Guide to Cooking on the Gourmet Guru! Your gas grill just bit the dust, and now you need to upgrade. Do you get the same grill you had but newer or do you try out something different? Looking for a new grill can be overwhelming with the number of different types of grills on the market today. Of course, we are a little biased when it comes to choosing grills and proudly recommend a kamado-style grill like the Gourmet Guru Grill. Here are a few FAQs to help you learn more about this type of grill and whether it is the right grill for you. 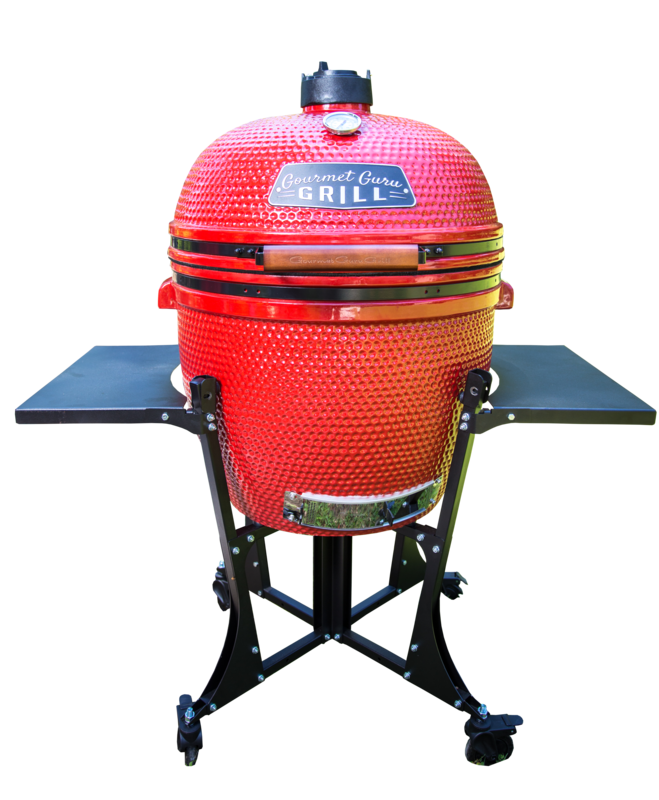 What is a kamado grill? The kamado grill is quickly becoming one of the most popular types of grills on the market today. However, these grills are nothing new. In fact, kamado grills have been around for almost 3,000 years. They have evolved over the years and come in different shapes, sizes, and materials. However, the majority of kamado style grills are made out of a refractory material like ceramic. And due to modern technology, most ceramic grills are designed to last for several years, and even generations, without cracking. What is lump charcoal used for? Lump charcoal is a type of charcoal that is created by burning wood slowly in the absence of oxygen. There are no fillers or additives. Many grilling gurus actually prefer lump charcoal over charcoal briquettes because it is pure, produces less ash, burns hotter, and lights quicker. These qualities make it perfect for heating up the Gourmet Guru Grill to a high temperature or searing a steak to perfection. 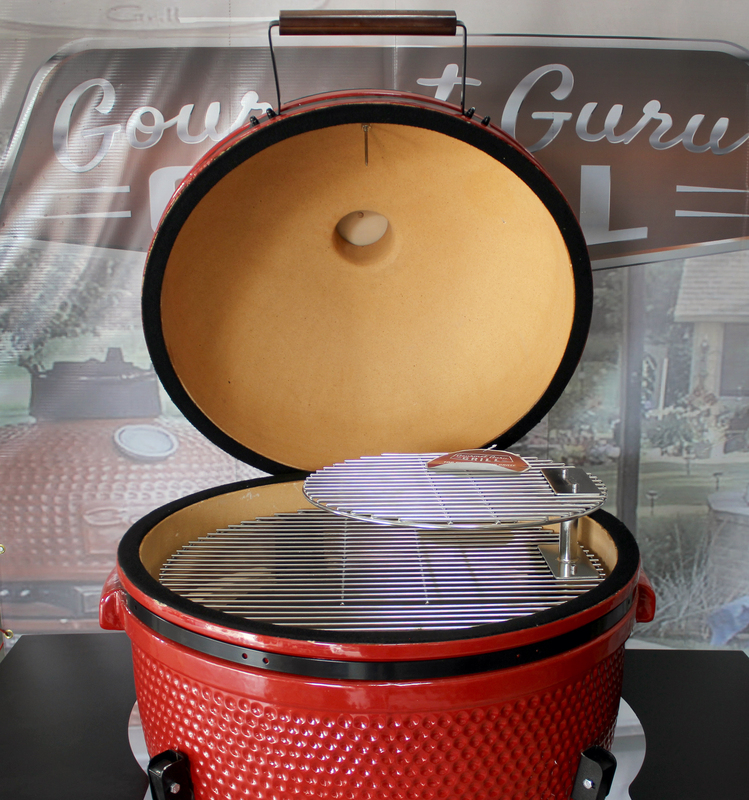 What can you cook on a ceramic grill like the Gourmet Guru Grill? What can’t you cook on the Gourmet Guru Grill? With the Gourmet Guru Grill, you get more than just a grill. You get an oven and a smoker. Grill up the best chicken wings and turn around and bake your favorite dessert. With a ceramic grill like the Gourmet Guru Grill, the possibilities are endless. What is indirect cooking on a ceramic grill or kamado grill? Indirect cooking is when you cook your food without the heat actually touching your food. With the Gourmet Guru Grill, you can use two different methods of indirect cooking. 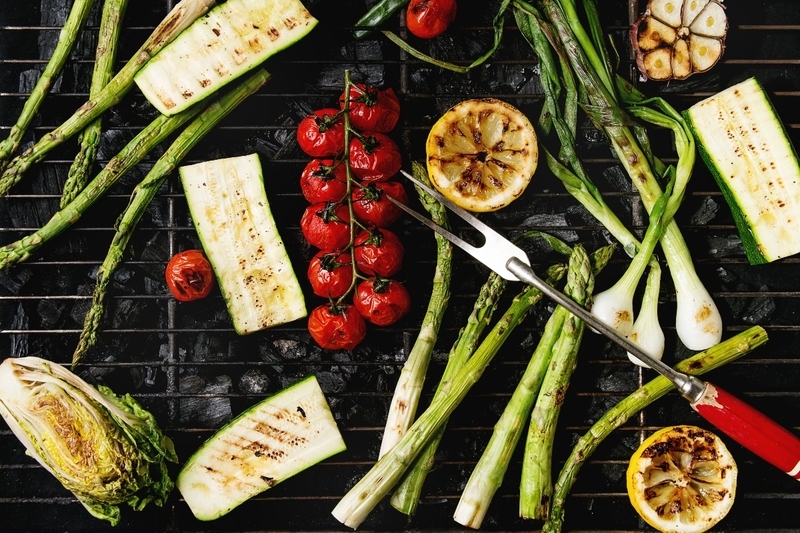 The first way is to create two zones of cooking on your grill. Push and position the lump charcoal to one side. The side with the charcoal directly underneath will be used for direct cooking such as searing a piece of meat. The other side will be used for indirectly cooking food that you may want to cook slower. The other method of indirect cooking uses a deflector plate like the Guru Ceramic Plate Setter. 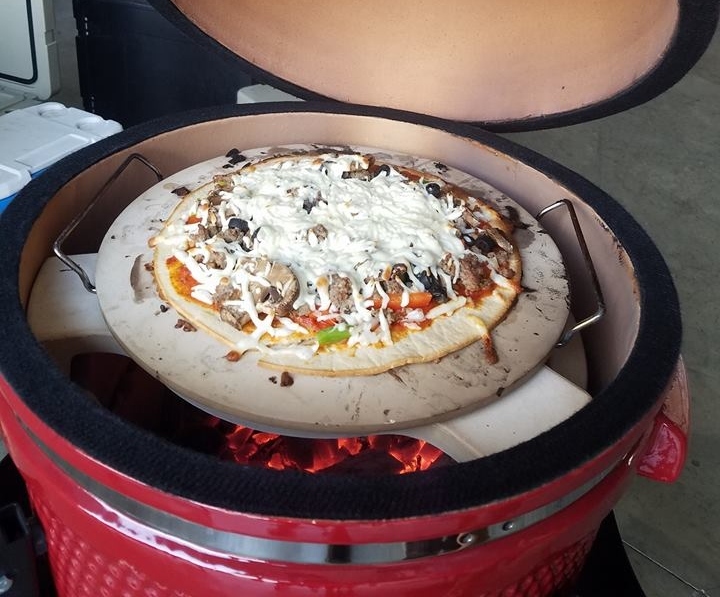 Adding this accessory to the Gourmet Guru Grill allows you to create the best-tasting pizzas, smoked meats, and mouthwatering desserts you have ever tasted. Is it difficult to learn how to use a ceramic grill? Like other grills, it takes a small amount of time to get to know the new and maybe different features of a new grill. However, there are several videos and blogs online that are packed full of tutorials and recipes. Don’t be afraid to try new recipes or cooking techniques. Once you get going on the Gourmet Guru Grill, you will feel like a master, or guru, of all things ceramic grill. Are there any must-have accessories for the Gourmet Guru Grill? It really all depends on what you plan on cooking, but here are a few accessories to get you started. First off, if you don’t have a stand or table to place your kamado-style grill on, then take a look at the different styles we offer on the Gourmet Guru Grill website. If you don’t have a lot of room, the Guru Metal Roll Cart is great. Not only does it hold your grill, but the sides also fold down to make it easy to store. If you are looking for something with a little more room, the Guru Universal Table is the one for you. 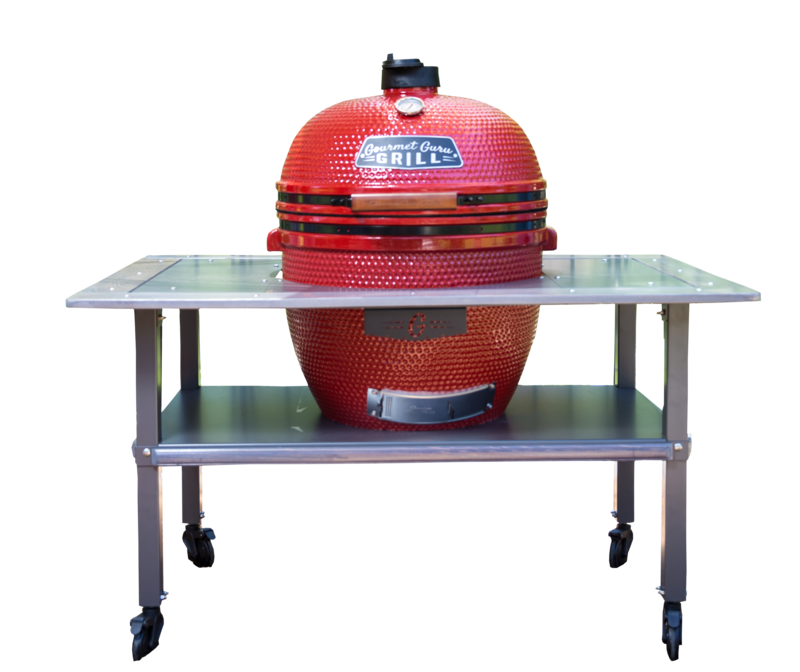 The table fits all Guru Grills and most other kamado-style grills. And if you want a more natural look, then you definitely want to check out the Guru Vintage Table. It has plenty of prep room and is made with durable cypress wood. For those who may want more room on the inside of their grill, you may want to look at our Top Shelf Cooking Grate. It is perfect for cooking multiple items at the same time and gives you 16 more inches of cooking space. Cooking with a ceramic grill like the Gourmet Guru Grill is a lot easier than you think. Start out by grilling up old favorites or create something new. Experience new tastes in the comfort of your own backyard with Gourmet Guru Grill. Visit our website to learn more and shop our grills, tables, and accessories or visit a Gourmet Guru Grill Dealer near you. Click on the WHERE TO BUY button to find a dealer close by and check out the red beauty for yourself.